It’s 1986 in Compton, Los Angeles and an unlikely group of youths form a successful hip hop group by the name of NWA – a group that will revolutionise the genre forever. With different musical abilities, growing fame and fortune, tensions run high and the group have artistic differences. Director F. Gary Gray returns to the director’s chair with a film that just might grant him forgiveness for The Italian Job (2003) and Law Abiding Citizen (2009). Straight Outta Compton opens in 1986. For those too young to recall the era, archival footage and news reports sketch out that the late 80s is the height of a crack epidemic and turf wars. Eric “Eazy-E” Wright (Jason Mitchell) is the first to be introduced as he narrowly escapes being shot in a guns-drawn dispute at a dope house that’s raided by the LAPD. Meanwhile, Andre “Dr. Dre” Young (Corey Hawkins) is working at a local disco club to get his DJ career off of the ground while his pal Ice Cube is starting life as a rapper, penning rhymes in a journal on the school bus. Soon, along with DJ Yella (Neil Brown Jr.) and MC Ren (Aldis Hodge), they will come together in the studio and channel their individual skills to create the start of something big. The narrative kicks off at full speed in a sometimes cartoon representation of the group. Despite a hint at a struggle to break in to the industry, it seems pretty clear sailing for them as they appear to be discovered immediately following the release of their first record. Signed to a record company with the help of their manager Jerry Heller (Paul Giamatti), their success is unstoppable yet fame and fortune soon causes rifts between the group members who just want a fair cut of the deal. The character development and their relationships, however, are not the focus of this film and, instead, it seems to center itself on the themes of censorship and police brutality. Rodney King’s story is a predominant segment of the narrative. King was a taxi driver who received nation-wide recognition after he was brutally beaten by a group of police officers who were then found not guilty. His case sparks riots across the city and are featured in the film. These scenes encapsulate the police brutality and race issues of the 1980s which seemed very real to the members of N.W.A at the time. However, it adds depth to the film as this is just as relevant today with cases such as Sandra Bland and Christian Taylor. Though primarily a biopic about N.W.A, it is safe to say that the film makes a powerful statement against police brutality, race and speaking out against preconceived judgement. The performances are spot on. Astonishingly, Straight Outta Compton features actors who not only look the part, but who are able to back it up with genuinely believable performances. The tragic death of Easy-E is dealt with sensitivity and handled well and sees Jason Mitchell execute the role brilliantly. Alongside him is O’Shea Jackson Jr., who besides being Ice Cube’s real-life son, is not only ideal casting for his uncanny resemblance to his father, but for his performance as a whole. 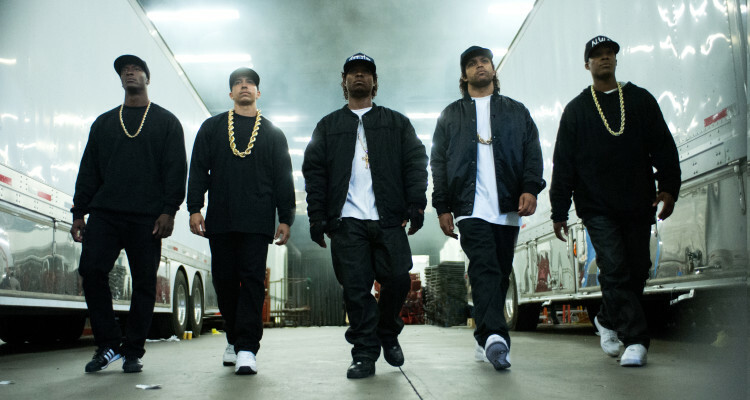 This certainly made for apprehensive viewing, yet Straight Outta Compton more than delivers. With some excellent performances, a powerful and potent underlying message, this may be more than just a rap biopic. Straight Outta Compton gets a Sophie star rating of 4 out of 5 stars. I may not be a fan of hip hop, but I enjoyed this film greatly. I’m not sure exactly how accurate this representation is, but it is definitely successful from a film-making point of view.